Today a garden room is commonly thought of as a room at the bottom of the garden, but in its traditional form it is an extension attached to the house. Typically garden room extensions are beautiful traditional designs with decorative details like finials, but there is a new wave of garden room extension appearing and judging by the popularity of articles about modern garden rooms on this site, a growing demand for a contemporary styled alternative to a conservatory or brick built extension. The Swift Organisation are leading the way in modern garden room extensions, or flat pack extensions as people type into our search, and have written a very useful guide for anyone considering a flat pack extension in our Garden Rooms Magazine. Its a natural progression for garden room designers to also design garden room extensions as many of the design and building elements are the same. These photos show one of Swift’s latest builds. Garden room extensions have many benefits for those of you looking to add extra space, they are considerably quicker to build than traditional brick/block extensions, they are highly thermally efficient thanks to the choice of the latest building systems, which is a major plus over brick extensions which can be leaky, and conservatories which are notoriously too hot to use in summer and then too cold to use in winter, they are also built to last, so will out live a conservatory. Another major plus is that they are commissioned on a turnkey basis, whereby the supplier quotes you for all the work, from foundations to internal decoration so you know what you are paying from day one, you can then sit back and watch your building grow as your supplier project manages all the elements of the build. Garden room extensions can also feature all the latest design trends such as floor to ceiling glazing, and walls of doors that fold back to create indoor/outdoor living spaces. 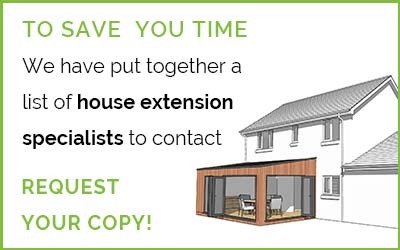 Download your copy of Garden Rooms Magazine to get our guide to garden room extensions.